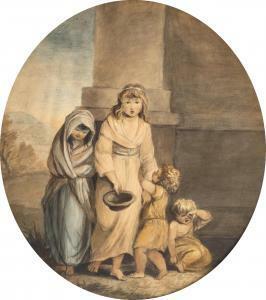 Find artworks, auction results, sale prices and pictures of Mary Hoare at auctions worldwide. 37 x 32.5cm (14 1/2 x 12 3/4in). Mary Hoare was the daughter of the renowned portrait painter, William Hoare of Bath, and was also an artist. She was married to Henry Hoare. A number of her works are kept by the National Trust at Stourhead. Mary was the eldest child of William Hoare. She later marriedinto a banking family. Mary was born at a time when ladies wereactively discouraged from becoming professional artists. However,William saw fit to encourage her to nurture her abilities: 'It ismy endeavour and desire to make the subjects she is employed in, alesson to herself as well as an exercise of her ingenuity' (see E.Newby, William Hoare of Bath, Bath, 1990, p. 16). Mary trained athome making copies after book engravings, or after her father's owndrawings. She won the gold palette for a drawing by a young personunder the age of 16 at the Society of Arts in 1760, but was notallowed to collect her prize. 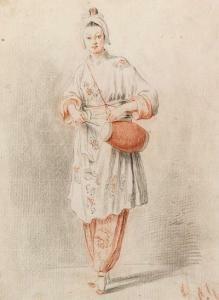 Evelyn Newby has suggested that thepresent drawing probably relates to a costume print and wasexecuted after such a publication under the supervision of herfather. The print would have been monochrome, but the particularcharm of the present drawing is in the use of red as well as blackpencil. This drawing was not included in the album mentioned in theintroduction. 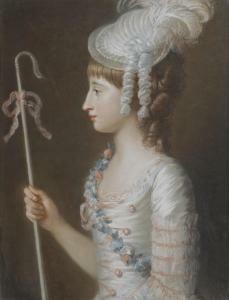 This pastel is probably the one recorded as the property of MrsWeddell, a friend of Mary Hoare. In her widowhood Mrs Weddell livedat Newby Hall, Kent, not far from Mary and was left a number ofpastels executed by Mary, by Prince Hoare, including one of Clytie.In Greek mythology, Clytie, daughter of the King of Babylon wasspurned by the sun god Apollo in favour of her sister. She wastedaway, and transformed into the flower that also turns its facetowards the sun. We are grateful to Evelyn Newby for her help inpreparing this catalogue entry.